Today my friend called with a brilliant idea. We should meet at the pool and each swim for half hour while the other watches both babies. I really wanted to swim and thought it was worth a try, so we met at the Presidio Y an hour later and I took the first baby-watching shift. 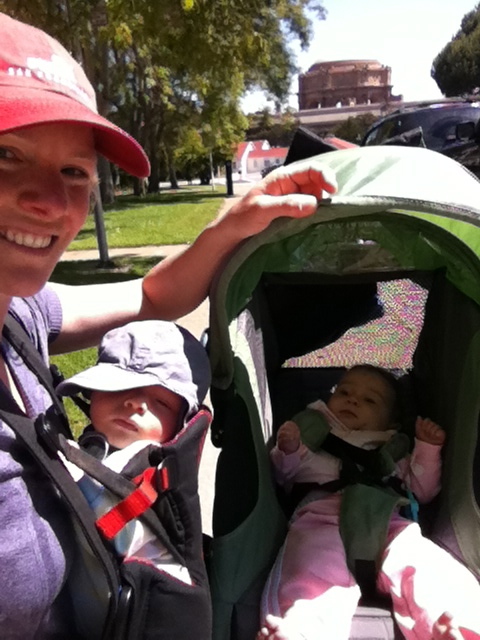 I strapped Baby A into the Baby Bjorn and pushed Baby R in her stroller. We wandered around the Presidio until I started hearing grunts from the stroller and saw little legs squirming. I’d been told that she might be hungry, so I found a bench and pulled out her bottle. Of course Baby A wanted in on the action so I wedged the bottle up while I undid the carrier and situated Baby A. As I breastfed one and bottle fed the other, contemplating how it felt to have two babies near the same age, two women with a gaggle of children walked up and asked me if they were twins. When my time was over both babies were reasonably content and I made the hand-off so I could fit in a short swim. Between changing before and showering after I had 20 minutes in the pool. Aside from a warm-up and cool down, I pushed myself hard to reach my goal of 1/2 mile. Moving fast in the pool felt really great and now I’m actually sore! I remember the time when a 40 minute mile would have been slow, but for now, the pace is better than I’ve done in quite a while. My body is curvier now than before but I’m moving rapidly toward my pre-baby stomach (which is really all I care about) and feel very healthy!